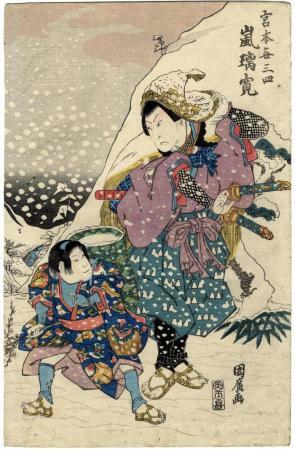 This print commemorates a performance of Katakiuchi Nito Eiyūki (復讐二島英雄記 - かたきうちにとうえいゆうき) at the Chikugo Theater in 1/1832. Katakiuchi (復讐) means 'vendetta' or 'revenge'. Eiyūki is 英勇記. The ki part (記) means 'chronicle'. Ikeda Bunko, Kamigata yakusha-e shūsei (Collected Kamigata Actor Prints), vol. 2, Osaka, 1998, no 61.